With Sebastian Vettel back on pole position, the weekend is looking suspiciously like 2011 all over again. However, we know that Hamilton is fired up and looking for his first win of the year, and we're eagerly awaiting the result to see if we get our seventh winner in seven races. There was some serious rain earlier in the weekend but it looks like things are calming down ahead of the race. A repeat of last year's epic extravaganza is not on the cards, but Canada should still deliver something special. Hello and welcome to the Factbyte Factbox for the Canadian Grand Prix! Two weeks on from Monaco, Formula One has turned up to the island park setting of the Montreal circuit, ready for another race. Some expressed disappointment about the action provided around the principality last time out, so are looking ahead to Canada to deliver. It usually does! Memories of last year are fresh, after the sport saw its longest race ever with a lengthy rain delay in the middle. However, at the moment, the sun is shining brightly. If you've missed any of the action so far this weekend, I can recommend two very brief updates to catch you up. Heikki Kovalainen and Bruno Senna both crashed, but had their cars patched up. Meanwhile, Pastor Maldonado had what appeared to be a small accident. It has necessitated a new gearbox though, dropping him five places from the 17th position he qualified in. The big talk this weekend focuses on the possibility of there being a seventh winner in seven different races. We've already broken the record with six, can there be another? Tweet from @pauldirestaf1: Race day, going to be a hot one. Lots of fans arriving at the track already, this place is one big party for the GP weekend. The driver's parade from Fernando's viewpoint, via @alo_oficial. All eyes were on Red Bull this weekend, as they dealt with the rule clarification that forced them to change their floor. A pole position is a good start to showing it hasn't distracted them too much. Button's qualifying was something of a disaster. He used up all the super soft tyres getting to Q3, and then went out for a lap on the softs. He now has to start on softs. After the session, Button said: "Today wasn't great, you'd have to say, and 10th isn't the best place to start, but it looks like being even hotter tomorrow – probably the hottest race of the year so far – so it may well throw up a few surprises for everyone. I still think we can still have a good race, even from the fifth row." Meanwhile, further back, Pedro de la Rosa qualified his HRT ahead of both Marussia cars, and it's left him on top of the world. De la Rosa said: "Ahead of tomorrow's race I think we can fight with anyone because our car has good speed and is stable when braking, so we aim to make the most out of this." The soft and supersoft combination is the same as Monaco. Experts are predicting more one-stop action today. Tweet from @BSenna: Looking forward to the race today!! Just about to go in and heat is high here in Canada!! Let's push!!!! Thirty minutes to the race start, the pitlane will be opening any moment now. Have you made your predictions yet? The fabulous @f1wolf provides an up close view. Lovely blue skies. Jean-Éric Vergne had a bit of a shocker in qualifying. After crashing his car, he went into the session with a lack of running. He qualified below both Caterham drivers. Interview with Christian Horner: "Seb had a great day yesterday, seems happy in the car. We know Fernando's going to be quick, Lewis will be quick, Mercedes are there as well. The racing as it is this year, who can tell what will happen in the race." Interview with Ross Brawn: "I think the way the track is, strategy and tyres is what the race is about. I think we'll see people start to fall out of position because of tyre degradation and temperature." Interview with Romain Grosjean: "The sun came so hopefully that will help us. The race is always different from quali, we are usually better. Let's score points and see at the end where we are. We can go for points and hope for points. It's really hot here. In France it's raining, so I prefer to be here." Tweet from @sarahholtf1: Blue skies & warm temps are not only in contrast to 2011 but have prompted Ross Brawn to wear a baseball cap & shades. Unusual look for him. Interview with Paul di Resta: "We're looking to go forward, but even maintaining eighth is going to be a task. There's some fast guys behind us. The car's been competitive, tyre degs going to be quite high, we'll see how it goes." 70 laps separate us from the winner of this race, and things are about to get underway. Vettel leads the drivers away on the formation lap, they're taking it nice and slowly. Worth mentioning there is just one DRS zone this weekend, rather than the two of last year. Detection is after turn 10 and activation before turn 13. Clean first corner for everyone, they snake around the first complex cleanly. Vettel streaks into the lead. Felipe Massa is close up behind Nico Rosberg, hustling the Mercedes driver for 5th place. At the hairpin, Rosberg locks up but still manages to cling on to his position. Paul di Resta is close behind Massa too, hoping to pick up the pieces of any action in front of him. Up ahead, Vettel has stretched his lead to 1.1 seconds, with Hamilton and Alonso behind him. 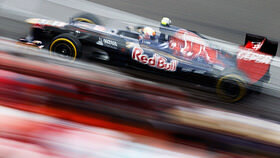 Daniel Ricciardo had a bad start, falling back to sit just ahead of teammate Vergne in 17th. Bruno Senna is sitting behind Heikki Kovalainen, and is chasing him for position, but the Caterham driver isn't giving it up easily. Both Massa and Di Resta have got past Rosberg, dropping the Mercedes driver down to 7th. Behind him, Romain Grosjean and then Schumacher in tenth. Vettel set the fastest lap of the race, but has now been beaten by Lewis Hamilton. Some early fast laps from the two in front. Felipe Massa spins it, he was running really well up in fifth, and has dropped down to 12th! Replays show it was just a spin, all by himself, no damage done except time lost. Team radio to Rosberg: "You need to do a better job looking after the tyres on traction." Rosberg radio informs him he might need to save fuel. Already! Most teams expecting a safety car at some point this race. Paul di Resta radio tells him his pit stop window is open - who will be the first driver to dive into the pitlane? Team radio to Button: "Okay Jenson, the option runners are showing signs of deg, let's stay with those cars in front." Button currently sits in ninth place, one ahead of where he started, and he's following Schumacher closely. Team radio to Hamilton: "You're quicker than him again, current gap 1.4, so you're getting close to the DRS." Good clean stop for Massa, soft tyres going on after he started on the supersofts. If they're one-stopping, that's a long way to go. Paul di Resta and Michael Schumacher both pit. Massa feeds out down in 20th place. Schumacher has come out behind Heikki Kovalainen, desperately wants to get past him but doesn't make it stick this time. Romain Grosjean sets the fastest lap of the race so far - 1:19.634. Räikkönen easily sweeps past Jenson Button for 7th place. Button pits, rapidly dropping down the order as the field is close in the middle. Vettel pits from the lead, as Button returns to the field alll the way down in 19th. It looked a tame pit stop by Red Bull's standards, and as Hamilton leads the race, Vettel feeds back out in sixth. Hamilton and Webber both pit, Lewis coming in from the lead. Alonso is now leading, yet to stop, of course. Hamilton has jumped Vettel for position through the pit stops. That could be for the lead, after Alonso and Rosberg come in. Alonso stays out for another lap - that's a big strategy call for the team. Replays show that Hamilton's pit stop was slow away - he lost about a second pulling away from the box - and he still managed to jump Vettel. Fernando Alonso comes in from the lead, and Rosberg follows him in as well. Alonso's gamble paid off, with the Ferrari coming out in front of Lewis for the lead. Hamilton is close enough behind him to challenge for position though. Going up the back straight, with the aid of DRS, Alonso ducked to the right to cover Lewis, but the McLaren got the position before the final chicane. Grosjean and Hülkenberg pit, Romain coming in from the lead to hand it back to the rightful current owner Lewis Hamilton. Hamilton's pulled out a gap of 0.7 seconds already - he'll be desperate to get ahead of the one second DRS limit. Karthikeyan spun, causing a brief yellow flag. Räikkönen, Kobayashi and Pérez in 4th, 5th and 6th respectively have not yet stopped. Yellow flags as Karthikeyan has stopped at the side of the track. Kobayashi comes in for his first stop of the day, soft tyres going on the Sauber. Glock receives waved blue flags as Rosberg and Grosjean approach. Pedro de la Rosa is pushed into the garage, with plumes of black brake dust billowing from the front of the car. A double HRT retirement. Hamilton sets the new fastest lap of the race, we're looking at 1:18.643. The field is beginning to spread now. Hamilton is just starting to lap, he's got both Marussia's under his belt already. Pastor Maldonado makes his first pit stop of the day, that's a long first stint for the Williams. However, Räikkönen and Pérez are still out there not having stopped yet. Pérez's lack of pitstop has seen him gain ten places - he's currently running in fifth place. Jenson Button pits from... quite far back... and he comes out on track... still quite far back. Rosberg sets a new fastest lap, as Glock is told over the radio to conserve his brakes. Canada is super hard on those brakes. Team radio to Webber: "Just hang in there, Mark, we're waiting for it to open up in a minute." Team radio to Button: "Think about the apex gear choice, go longer if you can." "I can't, I don't have the grip for it." Rosberg pits, returning to the track in ninth and some glorious clear air. As Rosberg left the pitlane, he managed to drive through a cloud of cement. Something must have happened in an earlier event to warrant that much cement dust. Bruno Senna is the next driver to show waved blue flags. 40 laps in and we've still only got three lapped drivers. Replays show Webber missing the apex and locked up his tyres at turn eight, allowing Grosjean to close up behind him. Kimi Räikkönen finally pits from fourth place - 41 laps on the one set of tyres. Kimi returns to the track just ahead of Rosberg. Nico gets past him in the DRS zone though. Pérez becomes the final driver to stop, and the Sauber car comes out in front of both Rosberg and Kimi. Rosberg has the momentum to take Pérez's place back, but the Sauber driver has gained the place over Kimi. Paul di Resta comes in for his second stop from tenth place. Schumacher runs wide off track at turn eight - his DRS is stuck open. Replays show it was stuck open when he came in to the pits, the mechanics banging it to try and shut it. He comes in for another stop to try and fix it. They're pulling and pushing it in all directions, but it doesn't look like they can get it closed. His race could very well be over. Race Control: Incident involving Vergne under investigation - pit lane speeding. Race Control: Drive through for Vergne - pit lane speeding. Hamilton reports that his rear tyres are going off, expect a pit stop any time soon. Tweet from @OfficialSF1Team: ROS in front of #Checo on a used and two laps "older" set of soft tyres. The battle of tyres! Vergne pits for his drive through penalty. TedNews: "We've sailed straight through the window for where we thought the second stops would be. Rosberg is a good barometer... They all want to try and do one stop if they can. Let's see what happens." Lewis pits from the lead, and it's a slow stop for McLaren with a delay on the rear tyres. Alonso now leads with Vettel behind. Hamilton third, just about 15 seconds behind them (a pit stop-ish gap). Webber pits now from fourth, and he returns to the track eighth. Button pits from 15th place. Yes, 15th. Hamilton puts in the fastest lap of the race - 1:17.135. Only Button and Vergne have made three stops, with one of JEV's being a drive through. Grosjean is currently sitting in fourth place, just one stop for the Lotus driver so far. Rosberg was late into braking at the chicane, cut the corner and was forced to give the position back to Massa. In doing so, he lost position to Pérez as well. Massa is now up to fifth, Pérez sixth with Rosberg settling back in seventh. Interview with Michael Schumacher: "It's a mix of hydraulic and mechanical system and we need to understand what exactly is the problem. We had once the problem in Bahrain, not clear if it's the same problem or another problem. "Maybe the positive is Nico can get some points for the team, at least in the championship we are not completely lost and nowhere. But for the boys on my car, it's certainly disappointing." Massa pits for the second time of the day. There are suggestions that Ferrari are talking to Alonso in Spanish on the team radio, so they can keep their plans somewhat secret. Hamilton sets yet another fastest lap, he is flying at the moment. Pérez takes over the fastest lap of the race - a 1:16.889. Alonso leads from Vettel, then, with Hamilton hunting them down in third. Hamilton is just 0.3 seconds behind the Red Bull. Vettel puts up nothing of a fight to allow Hamilton past, the McLaren moves up to second and starts his chase of Alonso. Comment from Ryan: New idea, this race goes on for four hours again so Sergio can win. Vettel pits from third place. Alonso's wing mirrors are full of Hamilton, who has closed the gap to less than half a second. Vettel returned to the track in fifth place, as he left the pits black smoke wafted from his rear tyres. Lewis passes Alonso and takes the lead of the race. It was a nervy couple of corners, but the pass went off without a hitch. Alonso's tyres can't be too healthy. Hamilton leads from Alonso, then we have both Grosjean and Pérez - both of whom have only stopped once. Romain Grosjean passes Fernando Alonso for second place! Alonso radio was not in English, but suggests they are now worrying about Pérez. Vettel bumped into the Wall of Champions sideways on, but continues with no apparent damage. Team radio to Vettel: "You're almost four seconds a lap faster than Alonso." Pérez sweeps past Fernando Alonso, who has now dropped from the lead to fourth place in as many laps. Brief yellow flags as Ricciardo spun and recovered himself at turn nine. The last lap begins. The real question is how far back Alonso can fall! Lewis Hamilton wins the Canadian Grand Prix! That is seven different winners for the first seven races. Bizarre and amazing. Romain Grosjean crosses the line second, with Pérez joining them on the podium. Sebastian Vettel finished fourth, setting the fastest lap of the race on the final lap - 1:15.752. Alonso comes in fifth, I don't think he will be too impressed with that. No Safety Car this race, unusual in Canada. Interview with Martin Whitmarsh: "I was only nervous for 70 laps. It was a long race, when we came in for that stop, we thought it was right, but you never know. All the data told us we were doing the right thing, as it turns out we were. Lewis did brilliantly, fantastic race. "This team is all about winning, so to get that in the bag is important to Lewis, I know how important it is to the team." Hamilton congratulates his two podium fellows: "Awesome job for you guys, eh?" The national anthem plays out as Hamilton waves from the top step of the podium. The trophies are given out, Grosjean doing a little jump when he's handed his silver cup. Pérez raises his above his head with a shout of joy. The champaaaaaagne flies with all the drivers bustling forward to pour it over the edge of the podium balcony. Lewis cheers on the podium. Tweet from @clubforce: Tough afternoon for @clubforce as points were not possible in the end. P11 for Paul and Nico just behind in P12. Press Conference Quotes - Lewis Hamilton: "It feels incredible. Firstly I want to say congratulations to these two lads. Also to the team who never seemed to give up. I want to dedicate this race to all the fans out there, who are always so positive and supportive throughout the year. This is where I won my first GP, I knew today would be tough, but I loved every single minute of it. "I never had a doubt in my mind that there wasn't a possibility to win. I was thinking that these guys are falling quite far behind, I assume they're doing a one stop, I don't think I'm going to be able to do a one stop... I had a couple of problems pulling away, maybe my fault, but otherwise the pit stops were great. We can keep on improving in every area." It was a crazy end of race, P5, P4, the pace stayed there. The team did a fantastic job. We knew with the heat we'd be better today. It's good for us, and fantastic to be on my second podium this season." Press Conference Quotes - Sergio Pérez: "To be honest, starting 15th, the last thing you'd have thought about was to end up on the podium. We went quite aggressive, the stop was very good, the second stint was good. I managed to overtake some cars in difficult manouevres. I saw that the degradation was not so high for me, I could manage my pace well. After such a bad day we had yesterday, we had a lot of trouble with the brakes, today is just great to finish on the podium. Our second time in the points, and our second podium, hopefully we can keep this way. We have been very unlucky, in Monaco for example. It's great to come back and do a podium for the team." Press Conference Quotes - Lewis Hamilton: "It's still sinking in, but it's been five years since I won the first time here, but it feels just as good. Again, just massively proud of the team for continuing to push. Feels great to be here on the top step, never take it for granted. This feels like the best race I've had in a very long time." The fabled Wall of Champions, a little bit battered. A race that took a while to get going, but led to a thrilling conclusion, with a surprising podium lineup to finish. Lewis Hamilton secured his first win of the year, after seeming more fired up than usual this weekend. That can only spur him on even more for the rest of the year. Both Pérez and Grosjean racked up their second podiums of the season, and a good points haul for their respective teams. Next race is in Valencia, and I think we all know what that means. This season, however, it could turn out to be a classic. Who knows? Thanks for joining me today and I will see you again next time! Keep it real, fact fans.